The Sav m/43 was a WW 2 era assault gun that served with the Swedish armed forces between 1945 and 1973. In total of 36 were built during 1944-47 by Scania-Vabis. These vehicles were initially equipped with short 75 mm guns but all vehicles were retrofitted with 105 mm guns in 1946. They would serve with both the infantry and artillery where they were organized in independent assault gun divisions or platoons. The Sav m/43 would be superseded by the Ikv 102 & 103 infantry support guns which featured a similar main gun on a much lighter and more mobile chassis. In September of 1941 the chief of the Swedish army officially ordered the introduction of assault artillery in the defense forces. It was envisioned that this spg supplemented by regular towed guns would allow Swedish mechanized and tank brigades to have artillery support with a greater degree of mobility and flexibility than previously achieved. 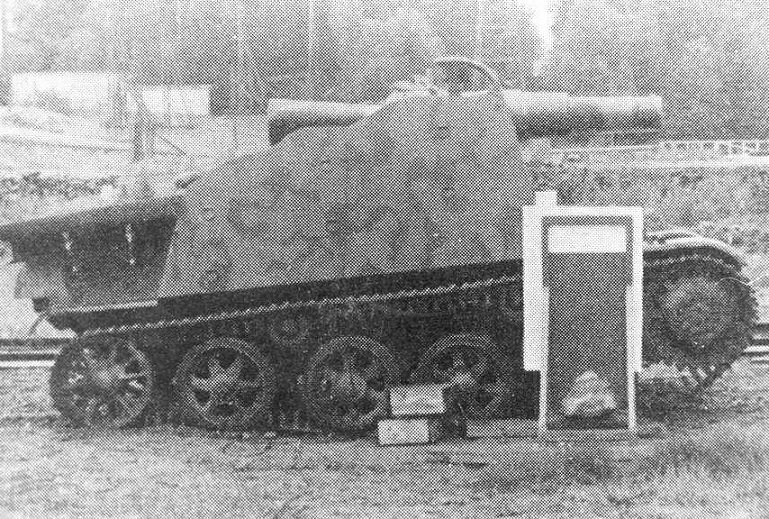 The idea had been directly inspired by the German and Soviet use of SPG’s in 1939-1940. – The HE round should be at least as effective as that used by the light field artillery. – The main gun should have some anti tank capability (at least 40 mm penetration at distance). – Since this vehicle is meant primarily for direct fire the effective range of fire can be limited to 4 – 5 kilometers. – The vehicle has to be able to achieve a high rate of fire, and should thus be equipped with a semiautomatic gun. – The vehicle should be able to conduct both direct and indirect fire. – Mobility must be such that the vehicle can always follow the infantry. – Firing height should be kept as low as possible. – There should be crew protection against small caliber weapons even at very close range, but a higher degree of protection is preferable. 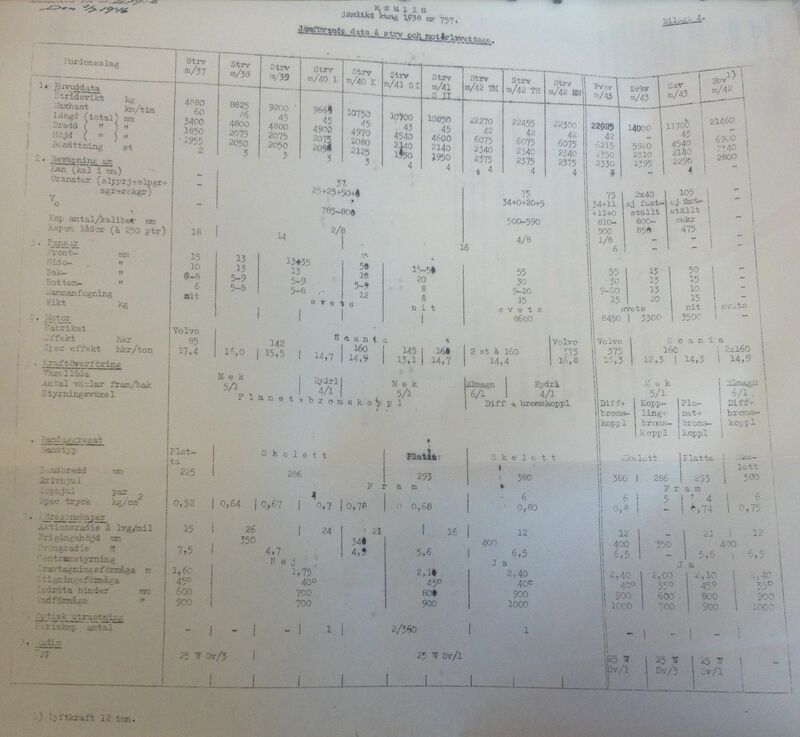 Working with what they had at hand KAFT would task AB Bofors with the construction of a test SPG based on the prototype Strv m/38 chassis in June of 1941. This vehicle would have its turret removed and replaced by a superstructure mounting a 75 mm kan m/40 L/40 infantry gun. 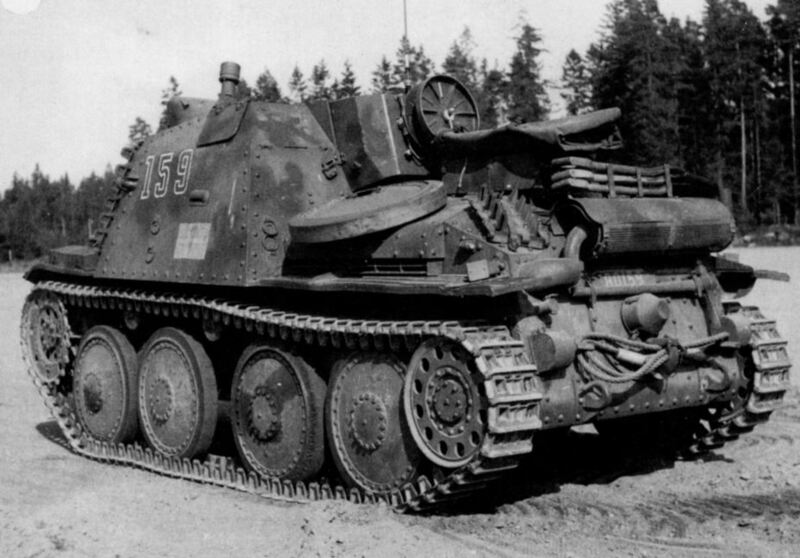 The converted chassis was designated Försöksbandpv (Literally translating to test vehicle tracked anti tank). This vehicle was tested until January of 1942. 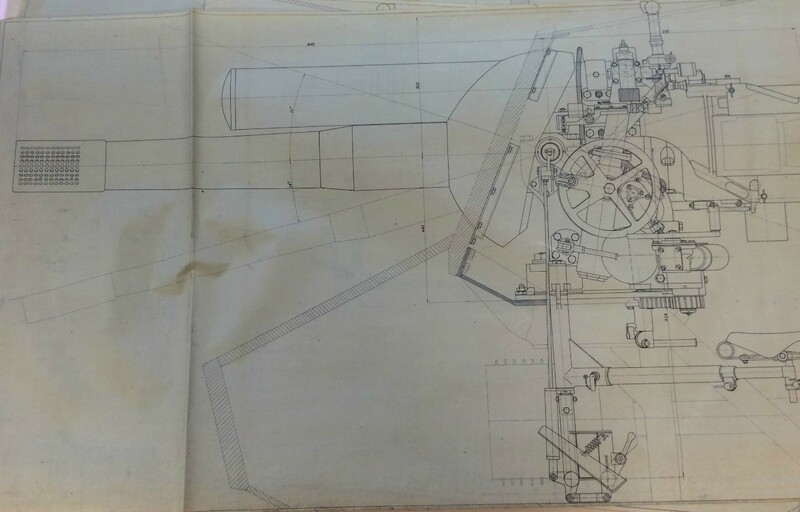 The gun on the Försöksbandpv used a ball mount and had a firing height of 1750 mm, it protruded 400 mm over the chassis front in its firing configuration and could be retracted into a travel position. 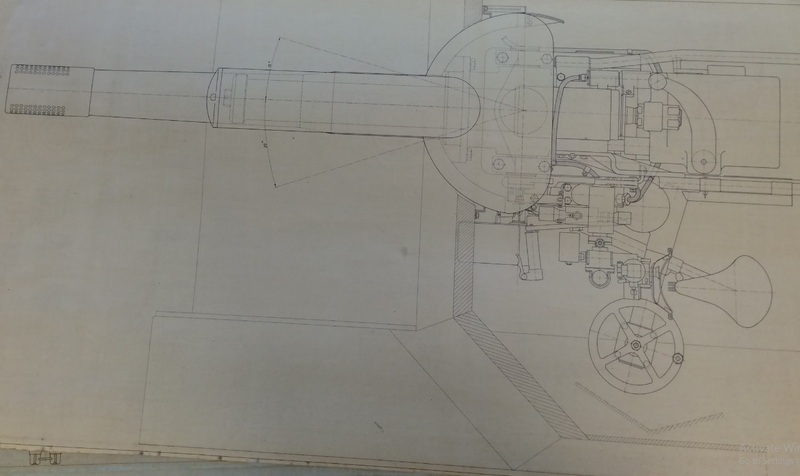 Due to a lack of space in the chassis the gun could not elevate beyond 0 degrees as the breech would have hit the rear wall of the crew compartment had the gun been fired, due to this testing was conducted at 0 dg elevation. In total 6 rounds were fired in the full traverse arc of 30 dg with a muzzle velocity of between 400 and 625 m/s depending on the round used. Testing was conducted without any problems, though the vehicle did move about 5 cm during firing due to the recoil. With the positive results of the testing KAFT made the decision to continue the projects development as a potential answer to the SPG requirement. It was envisioned that existing light tank chassis like the Strv m/38 & m/39 could be converted to the configuration used by the Försöksbandpv by using the older 75 mm model 1902 gun which was going out of service at the time. To more closely test this configuration it was decided that the prototype would have its superstructure rebuilt and fitted with this gun. 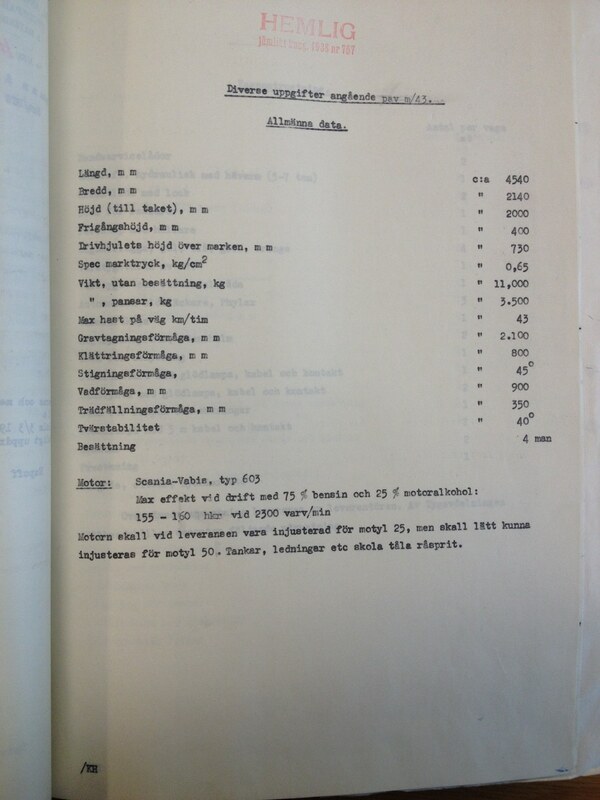 The rebuild was estimated to be finished by June 1942 and was expected to cost 35000 kr. However KAFT was not entirely satisfied with the this concept due to its low armor protection and lack of neutral steering. Therefore several alternative designs were discussed including a design based on the L-62 SPAAG chassis & one based on the conceptual Landsverk Terro light tank. These were quickly dismissed due to a lack of armor protection and the time it would take to set up production respectively. One of the more interesting concepts discussed was to base the SPG on the 23 ton Pvkv m/43 tank destroyer chassis that was under development. 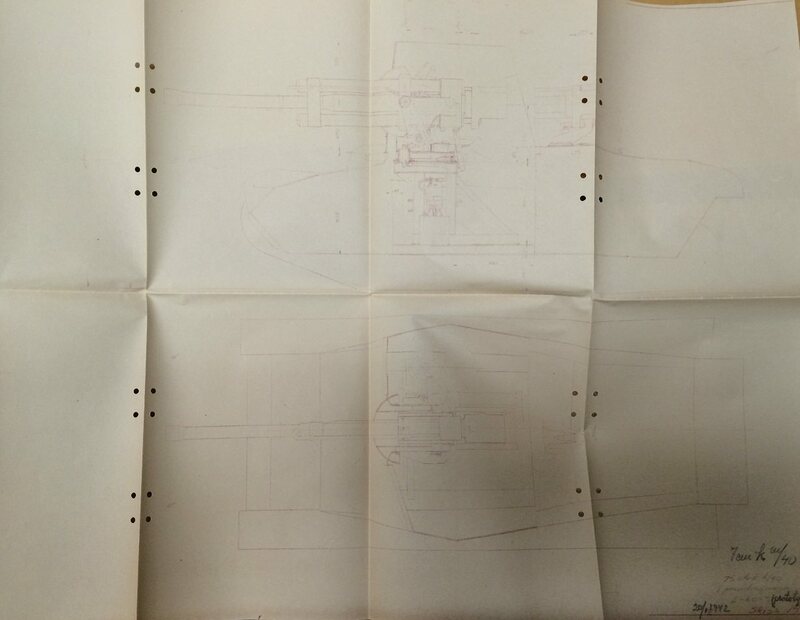 Work on drawings for this TD was already mostly complete with a prototype chassis with a 75 mm L/50 gun ordered for testing in late 1942. 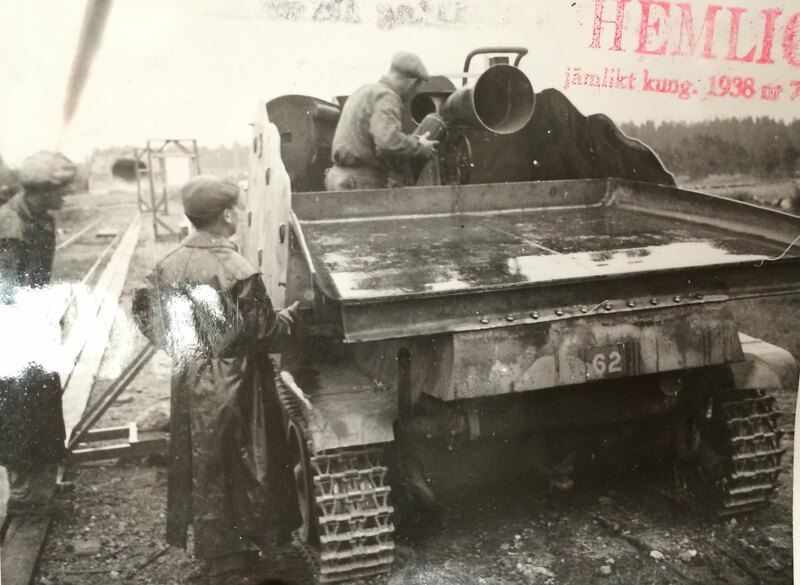 The heavier chassis would allow the mounting of the larger caliber 10,5 cm haub m/40 howitzer and would require few if any modifications to the design. 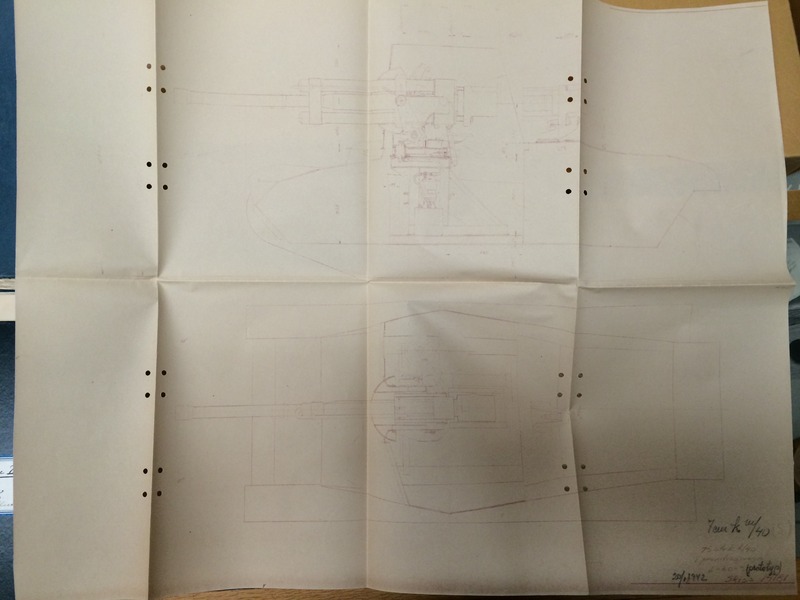 Plans for testing and acquiring 8 vehicles in this configuration would remain well into 1943. 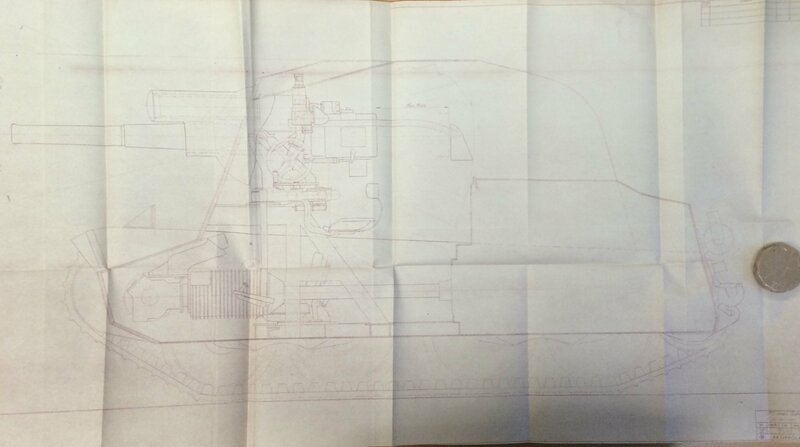 Finally it was suggested that a lighter alternative design should be studied based on the TNH-SV chassis. 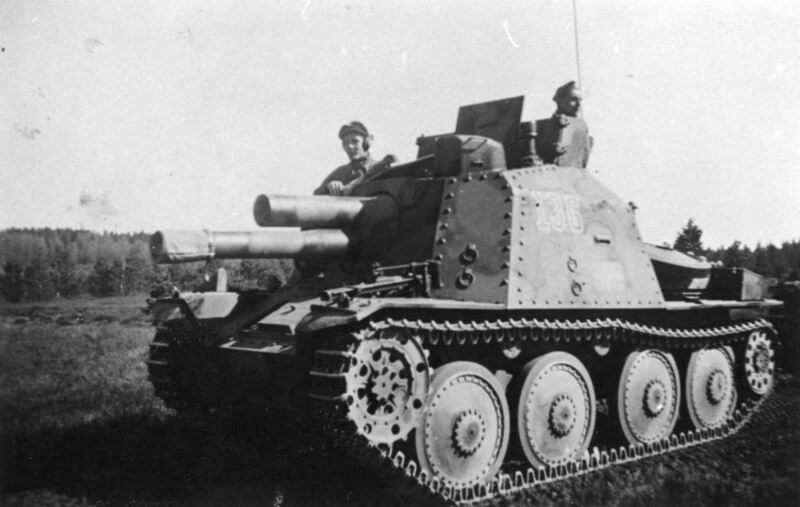 The TNH-SV was a modified version of the Czech Lt vz.38 (used by the Germans as Pz.38t) which was being produced under license for the Swedish army as the Strv m/41. 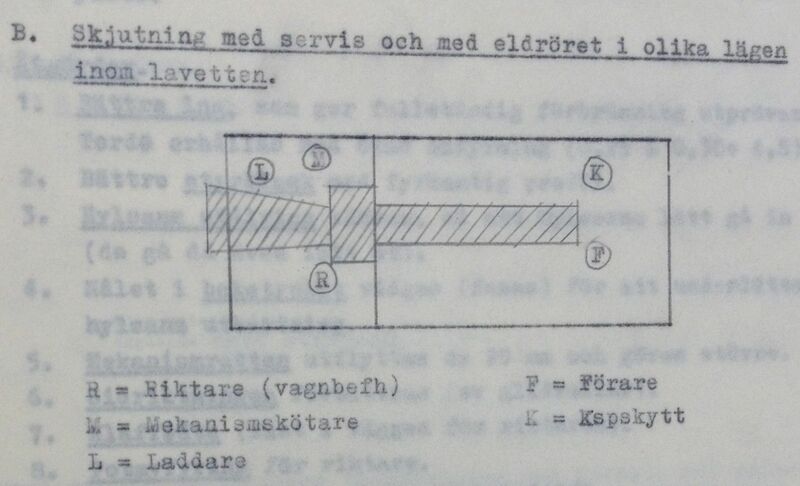 This initial concept would have mounted the 75 mm L/31 gun used on the Strv m/42. A wooden mock-up of this vehicle was constructed and shown to KAFT representatives on the 13th October 1942, at which point a number of changes were agreed upon. The height of the vehicle was reduced by 75 mm, the sloping of the side armor was increased, The rear of the superstructure was shortened by 350 mm and a large roof hatch was added. 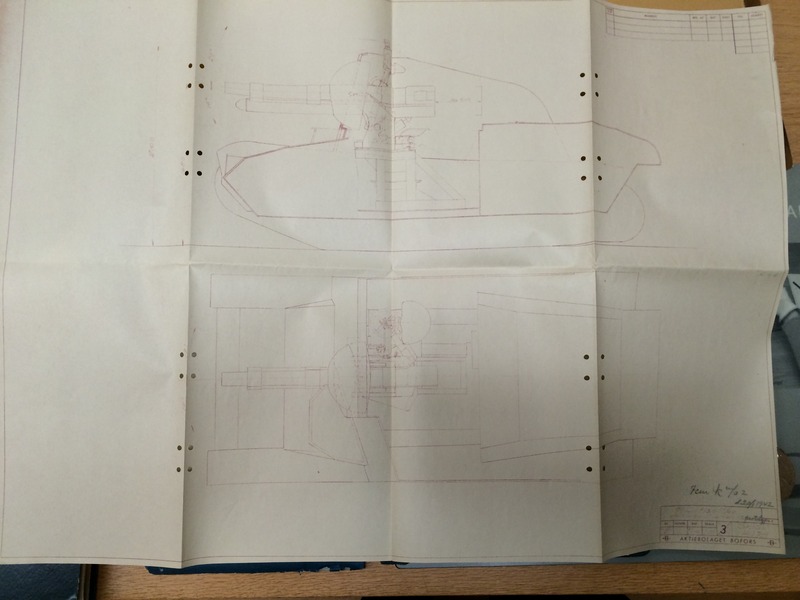 A prototype incorporating these changes built on the TNH-SV prototype was ordered by KAFT on the 15th. The vehicle would have a combat weight of no more than 12 tons and share as many components as possible with the newer model Strv m/41-S/II which had an improved 160 hp engine and increased armor protection. KAFT also requested that the vehicle be welded instead of riveted, however Scania-Vabis were unwilling to switch construction methods. 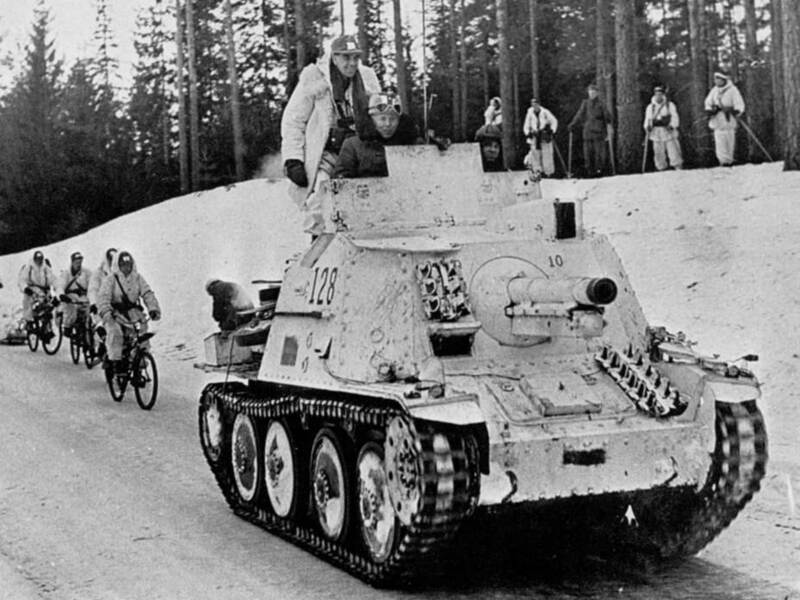 A proper name for this vehicle was also agreed upon, the assault gun would be called Pansarartilleripjäs model 1943 (Pav m/43) translating to armored artillery vehicle. 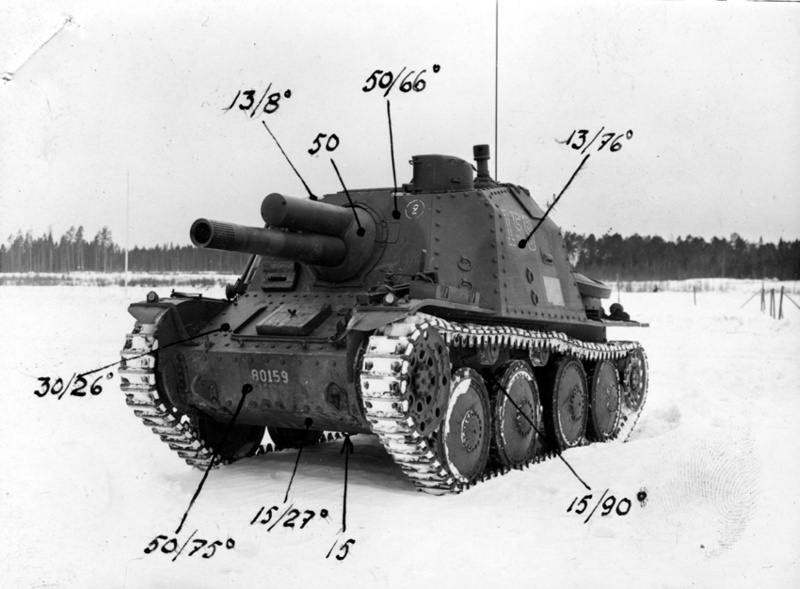 The Pav m/43 prototype was delivered to the Swedish army for automotive and live fire trials in October 1943. The vehicle preformed excellently during the tests, requiring only a couple minor changes to be deemed ready for production. The front of the superstructure was simplified, a bustle for a radio station was added and the placement and shape of hatches & viewports were changed. 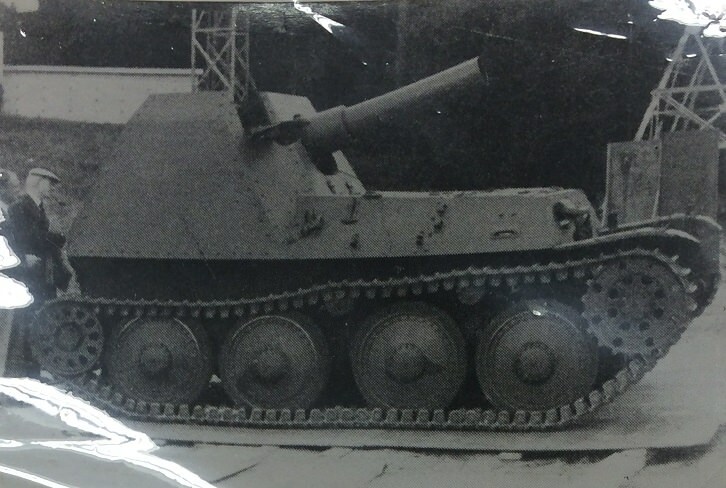 Equipped with the 7,5 cm kan m/02 the Pav m/43 prototype could reach a rate of fire of 8-11 rounds per minute depending on whether the shell casing was thrown out of the fighting compartment between shots or not. 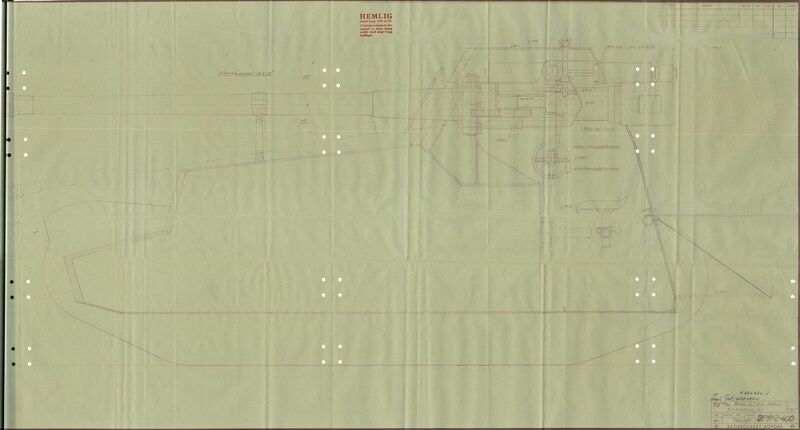 This gun would be used on the initial production versions of the vehicle but was to be replaced by a brand new 10.5 cm Kan m/44 Sav L/21 gun which improved HE and AT performance as well as improved elevation angles in 1945-46. Scania-Vabis received an order for 18 vehicles on the 15th of November 1943. 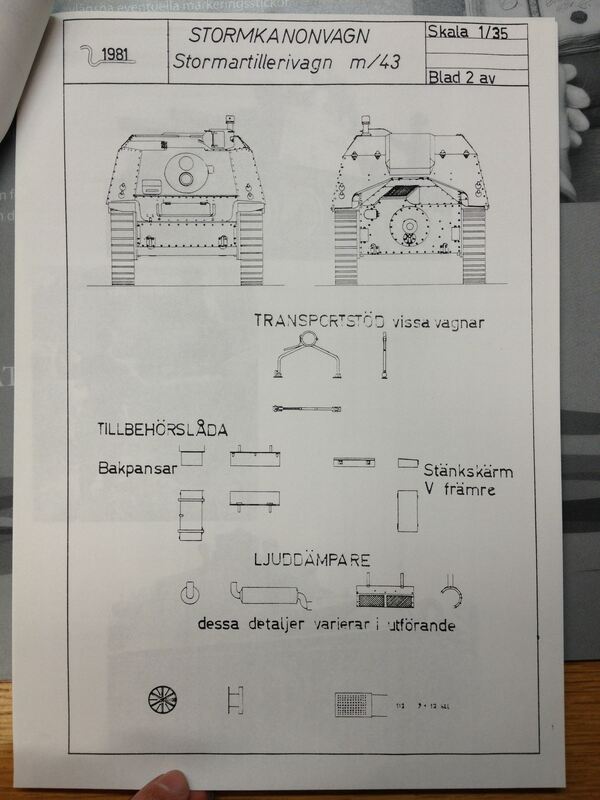 The following month the designation was changed to Stormartillerivagn m/43 (Sav m/43). 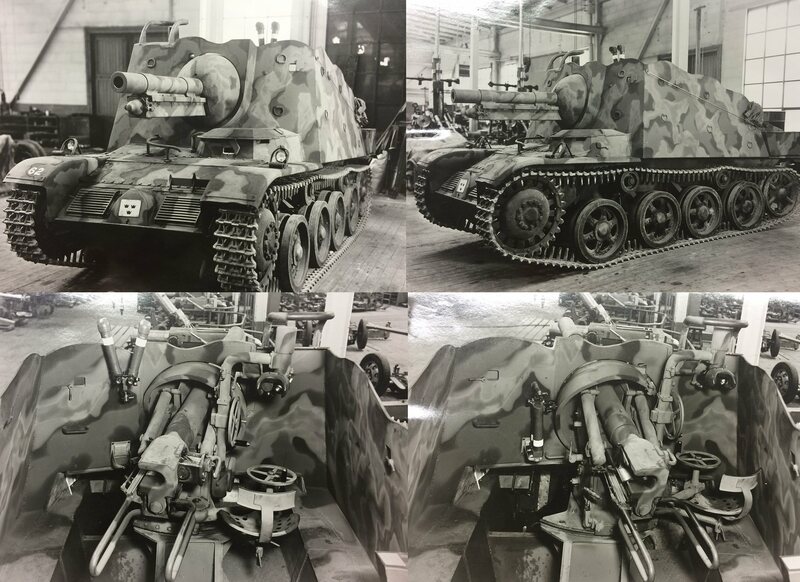 In parallel with the development of the Pav m/43 KAFT in cooperation with Bofors had continued testing ideas for the SPG requirement on the strv m/38 based chassis. By July of 1943 the vehicle had been rebuilt yet again, this time with an experimental 15 cm recoilless rifle based on the 15 cm fsthaub m/02 fortress gun. 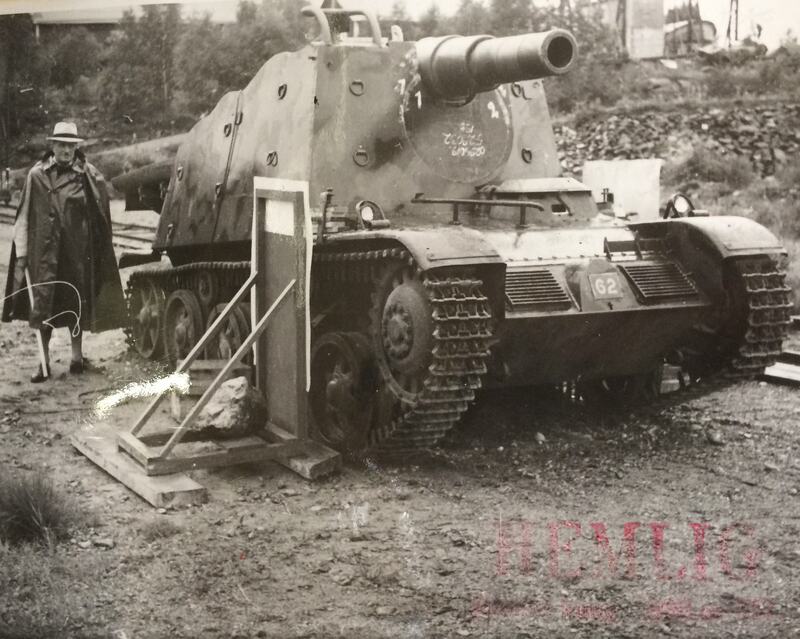 This impressive gun fired a 37 kg high explosive shell at 300 m/s and had good firing characteristics, however the overloaded and cramped chassis suffered from a poor rate of fire and low mobility. Despite the obvious drawbacks of this design serious consideration was made to convert 12 Strv m/38’s to this configuration as a quick and easy alternative to the Pav m/43. The vehicle was demonstrated to KAFT representatives and the chief of the army on the Bofors test range on the 4th of November 1943. 16 rounds were fired at a variety of targets from prepared positions and in terrain without fault. 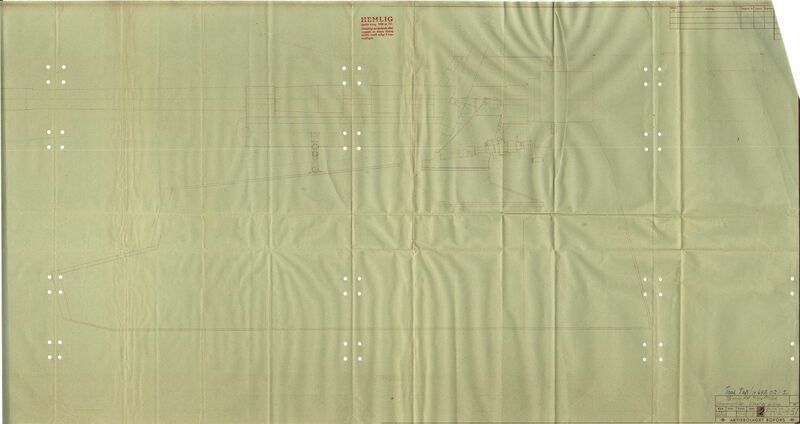 The results of the testing was that the gun was deemed a valuable asset, however a new purpose designed chassis with room for ammunition and personnel would need to be constructed should the gun be fielded. Work on such a chassis began on November 11th when KAFT asked Scania-vabis to construct a new type of SPG to investigate the merits of using a rear mounted superstructure. While the driver would retain his position the engine would be moved as far forward as possible & the rest of the crew would be moved to a open topped compartment at the rear to give them more room for servicing the gun. The superstructure was to be constructed as that of the Pav m/43 though with the modifications necessitated by the new configuration. 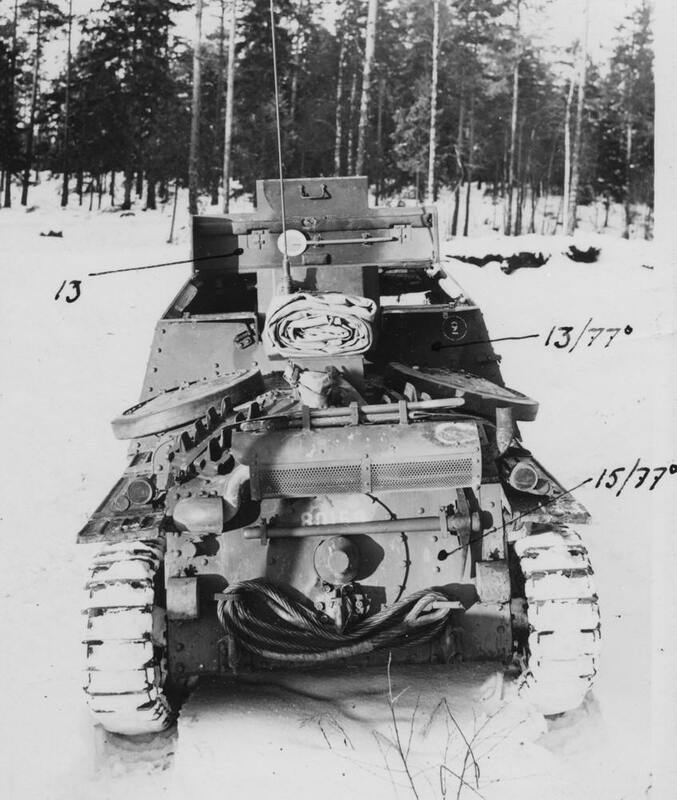 The 15 cm Stormpjäs fm/43-44 or “Trätoffelvagnen” (Translating to clog wagon) as it came to be known would be finished and tested in august of 1944. The vehicle weighed around 10 tons and mounted a slightly lengthened version (by 400 mm) of the 15 cm recoilless rifle tested the previous year. 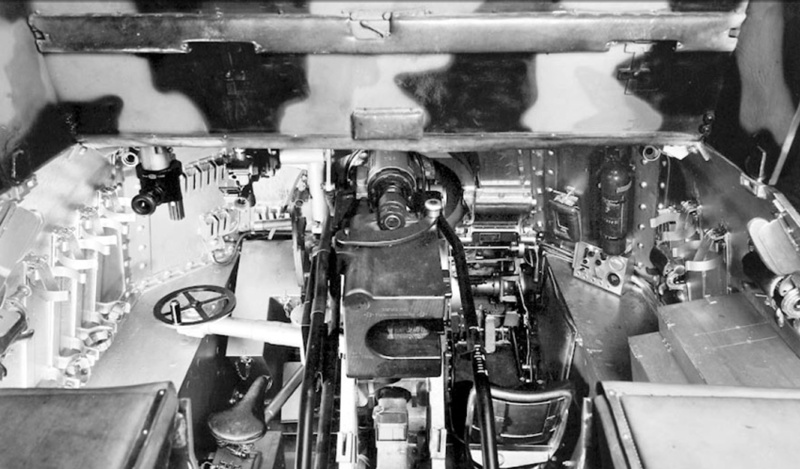 The crew consisted of two loaders (L) & (M) located on the left side of the gun, one gunner/commander (R) on the right and a driver (F) and machine gunner (K) located in the hull. The vehicle was successfully tested on the 18th of august 1944, firing 17 rounds at a target at 530 m range. With the 3 man gun crew a rate of fire 4 rounds per minute was achieved. In October 1944 the chassis was also tested as a tank destroyer by mounting a 75 mm Pvkan m/43, plans were also drawn up for a version mounting the 7,5 cm Lvkan m/36 L/60 anti aircraft gun by AB Bofors. 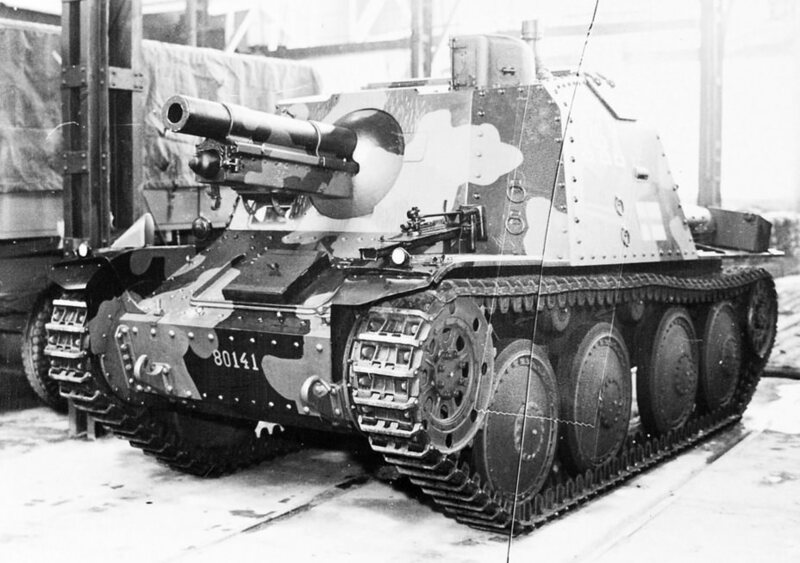 This version was tested as a alternative to the introduction of 7,5 cm towed anti tank guns and would have been able to dismount the gun for use in fortified positions. This version was referred to as Motorlavettage 10 ton (gun carrier 10 ton) or simply as Sav fm/43 with 75 mm pvkan m/43. 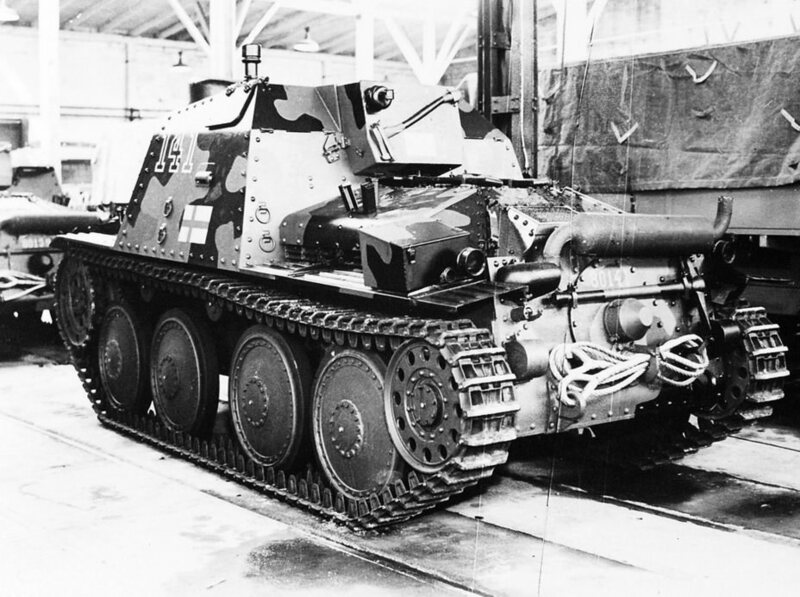 After further trials in 1945 the project was canceled and the chassis used as a training vehicle for the Sav m/43. After some delays deliveries of the Sav m/43 began in January 1945. The Sav m/43 was initially used by the artillery and was organized in two assault gun divisions with three batteries each. These divisions were stationed at the Norwegian border until the German capitulation in ww2. They were used in the same way as conventional artillery as mechanized guns. In 1945 an additional 18 vehicles would be converted from the Strv m/41-S/II production to equip the 2nd assault gun division. Deliveries were planned to be ready for late 1946 but the delivery ended up being delayed by 6 months. By this point all vehicles were refitted with 10,5 cm guns. In the 50’s the Sav m/43’s were transferred to infantry brigades in northern Sweden, where they were used in the role of fire support vehicles. 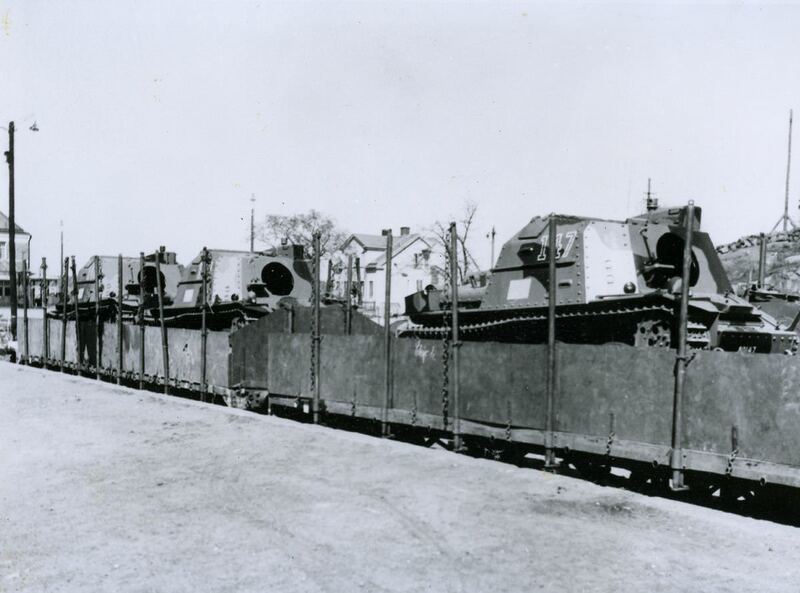 They were organized in assault gun platoons equipped with six vehicles each, making for a total of 6 platoons. With the introduction of the Ikv 102 and 103 in 1956-57 the heavier Sav’s were transferred again, this time to infantry brigades in Skåne. In the early 1960’s all Sav m/43’s were retrofitted with the 142 hp Scania-Vabis 1664/13 engine as the more powerful 603/2 was needed to replace the unreliable engine of the Pvkv m/43 tank destroyer. The Sav m/43 were in service until the early 70’s when the last remaining Sav’s were weeded out and replaced by Strv 74’s in the assault gun companies. 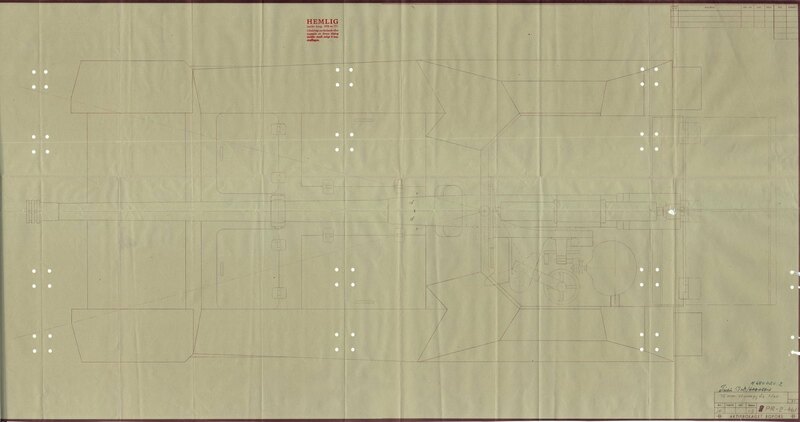 Ammunition placement: 6 rounds beneath the gun, remaining rounds on the side of the crew compartment. 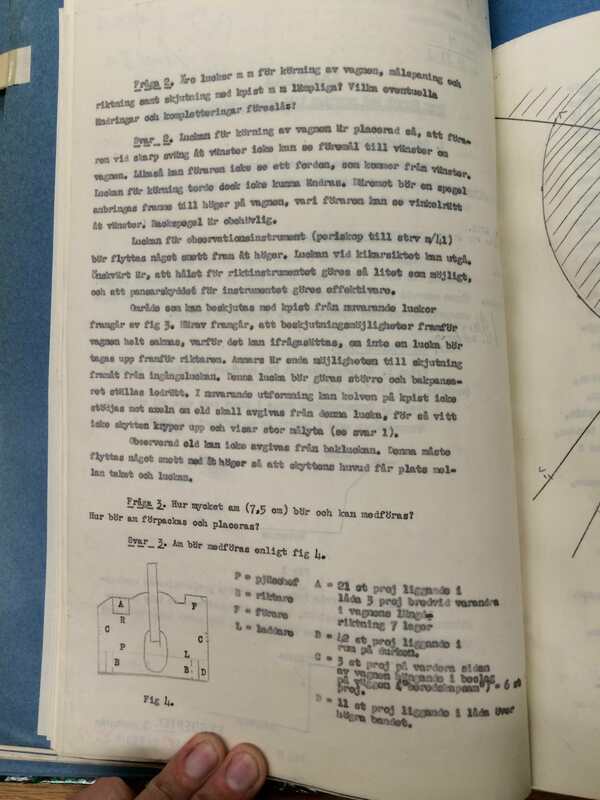 This article is part of the Swedish tech tree project for War thunder. If you want a swedish tech tree in War Thunder check out the Swedish ground forces thread on the official forum. Awesome article! 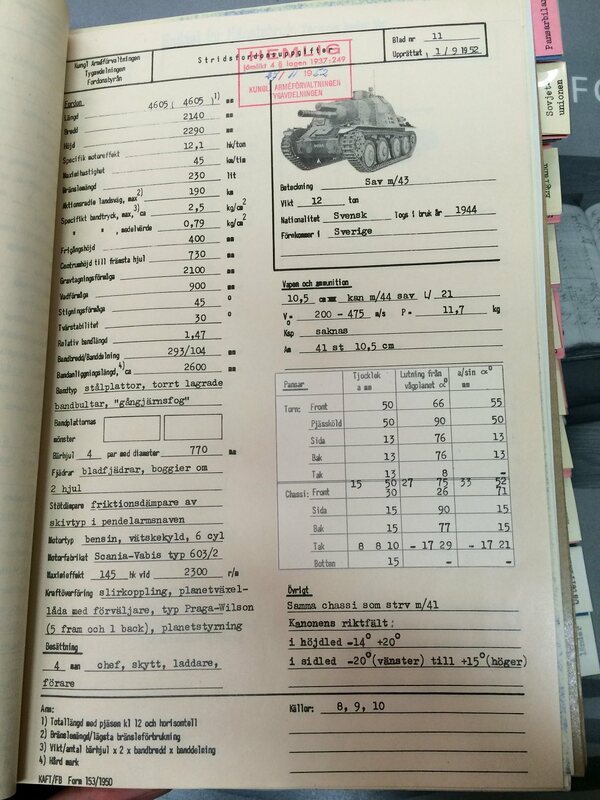 It’s nice to get to know “paper tanks” I never knew existed, like the försökbandpv (copy-pasted that ;)). 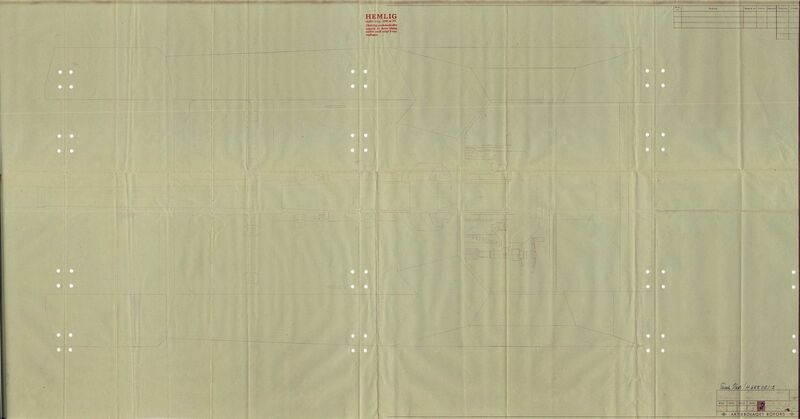 This makes me wonder… just how many paper tanks or concepts does Sweden actually have? 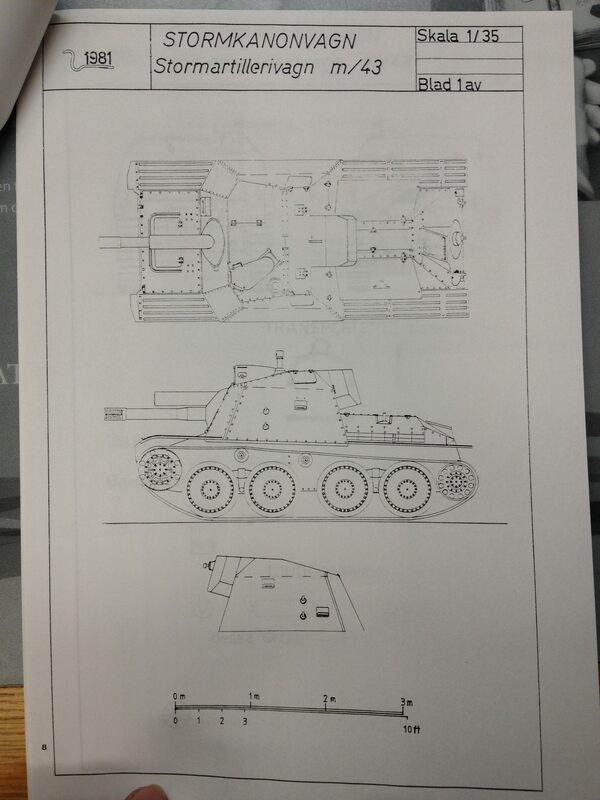 The number of post-war S-Tank concepts is just staggering.